Part of being an entrepreneur is the ability to provide happiness to your satisfied customers. One afternoon, I was able to close two deals. Both ladies purchased authentic Prada bags from Juyable. After the client meet up, my partner and I decided to treat ourselves with a hearty lunch. We roam around the mall for more than 10 minutes and finally, having known that my partner loves Japanese food, I suggested that we try Yabu. He told me that he read a lot of good reviews about the food and restaurant per se. Curious and hungry, we reserved a seat for two. Luckily, the line was not that long, so we immediately had our reserved seats. The place is quite small compared to other Yabu branches. They needed more space so they put up tables and chairs outside, but the good thing is, it is still inside the mall. 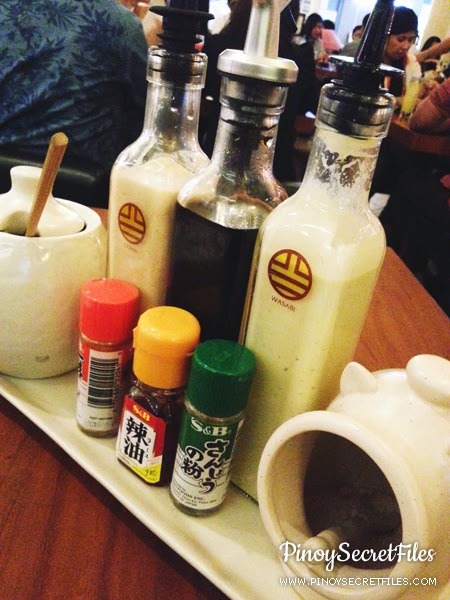 As soon as we got seated, we tried to figure out the foreign and unfamiliar condiments on our table. Good thing, our server is helpful enough to educate us what are those for. 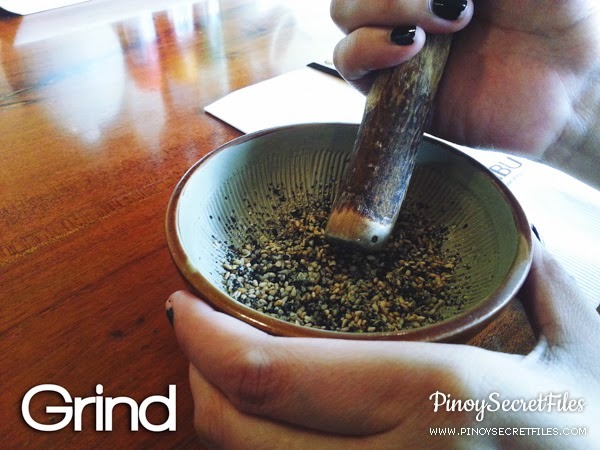 They will initially serve a dish of black and white sesame seeds with a wooden pestle. This is for the katsu sauce. First, you have to grind the black and white sesame seeds. You can smell its aroma as you crush it. Second, pour at least three scoops of katsu sauce (depending on your taste) on the crushed sesame seeds. 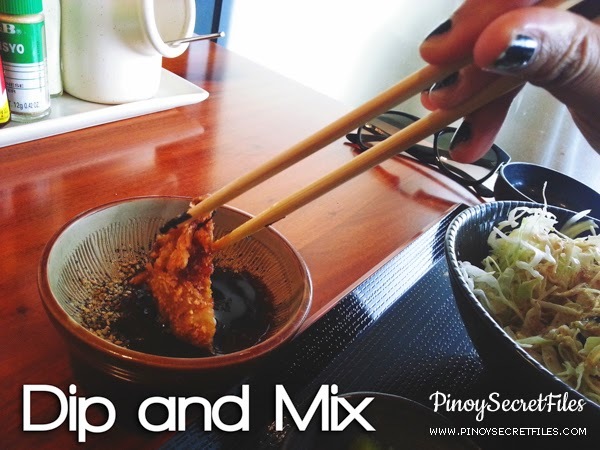 Lastly, you mix and dip your katsu to its sauce. In my case, I want to dip my katsu first and use it to mix the sauce. You may choose between wasabi or goma dressing. In my case, since I'm not a fan of spicy food, I prefer goma dressing. 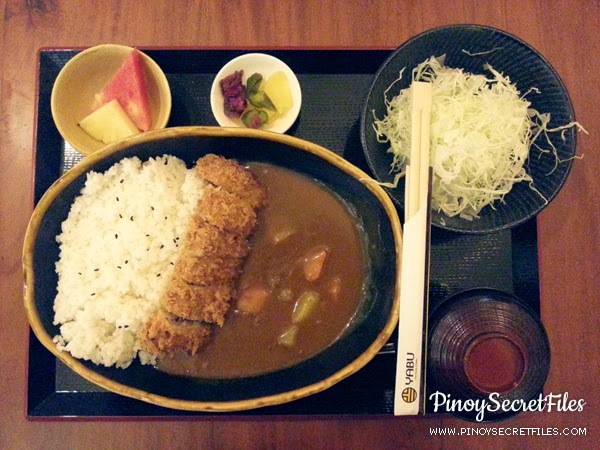 After browsing the menu, we ordered Menchi Katsu for me while partner's was Hire Katsu Curry. While waiting for our order to be served, I saw a familiar face. Then I remember,Nestlé main office is located in Rockwell. 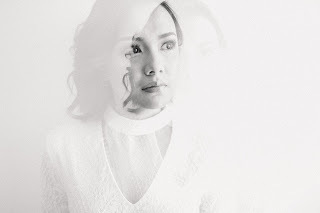 I saw my college schoolmate who used to work at Nestlé Cabuyao, where I also had my internship. We had a small chit chat then bid our goodbyes. 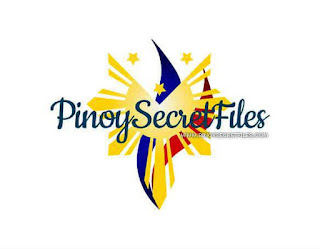 It was nice to see old faces especially in Makati. Here's my Menchi Katsu. 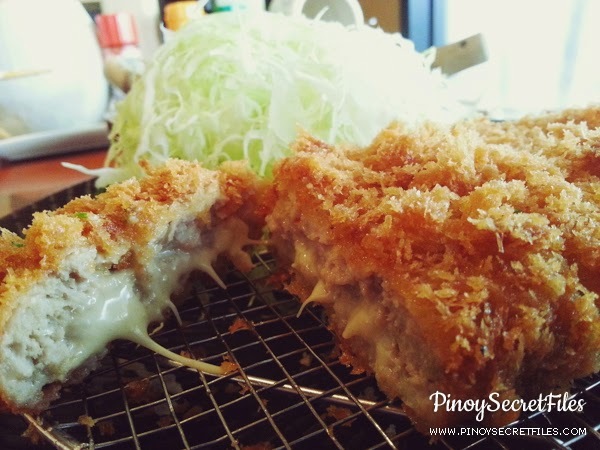 Menchi is a delicious mix of minced premium beef and pork covered in crunchy panko filled with oozing creamy cheese. Honestly, I ordered this because the picture on the menu seems so delicious and yes, it is! I love the fact that the katsu per se is not oily and has the right crisp. Though you might want to slow down and just bite little portions so you won't get tired of eating it. 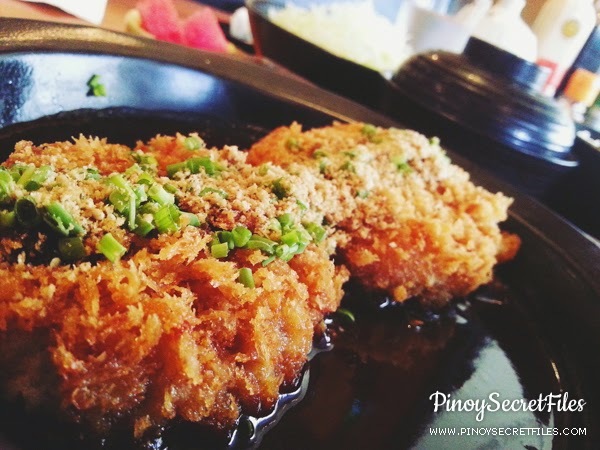 Don't forget to dip it in the katsu sauce with sesame seeds to complete your Yabu katsu experience. Their miso soup is so tasty that I almost finished two bowls instead of drinking water to quench my thirst. Here's my partner's Hire Katsu Curry. Of course, I also get to taste it. 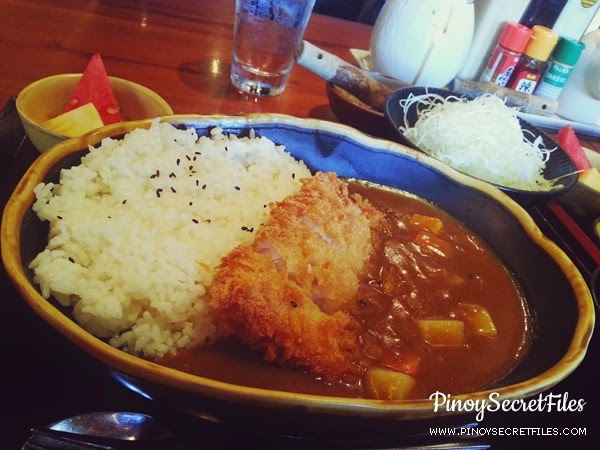 Fun fact: Japanese curry which rose to popularity in Japan during the Meiji era in the mid 1800's is made of thicker, sweeter and milder compared to other Asian countries. 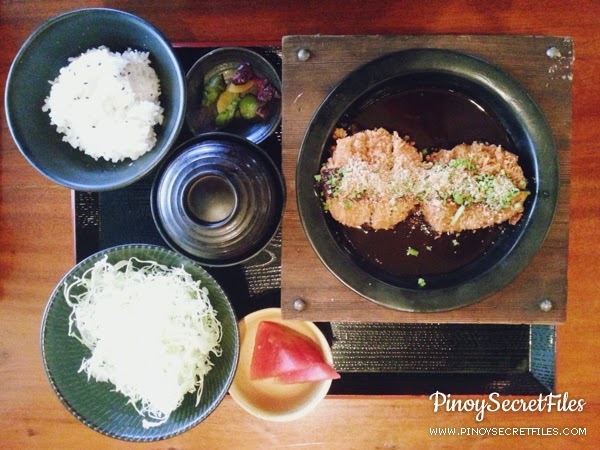 Yabu's curry is made of forty-five secret ingredients and slow-cooked to perfection for three hours. At Yabu, you can tell our server how spicy you want it, whether Regular, Hot or Very Hot. My partner preferred Regular. Since I'm really not a fan of curry nor spicy food, I wasn't able to enjoy it. The curry is tasty and I must say my partner really enjoyed it. But what he really enjoyed was the unlimited organic cabbage with goma dressing and his favorite pineapple which is unlimited as well. 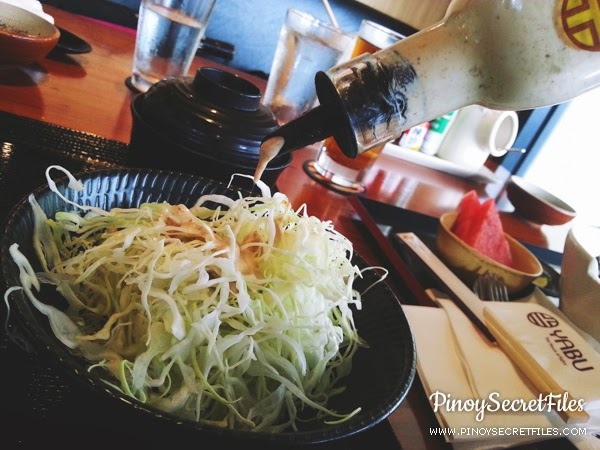 Probably after not more than three weeks, we craved for more, so one Saturday morning, we decided to have our lunch date at Yabu Glorietta 5. The place is bigger than Power Plant's and I really love its spacious and laid back environment. I also enjoyed reading the comics type wall decals which are informative as well. 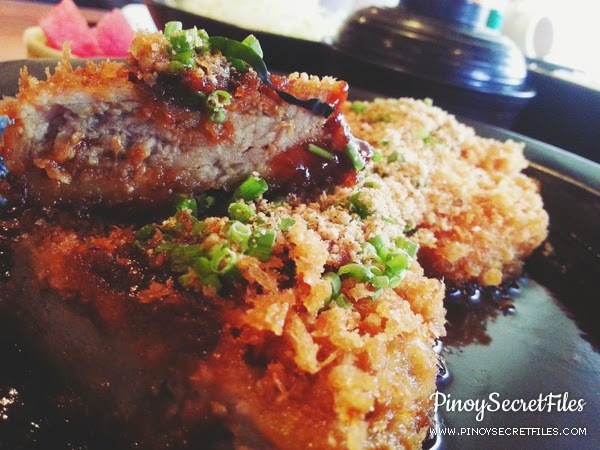 The Rosu Pork Loin is 3/4 inch-thick with a sliver of glistening fat trimming its edges and deep-fried in crisp golden panko. It is delicious and less "umay" factor than Menchi Katsu. I'm glad that I ordered 90g since I'm having a hard time to bite because my braces were newly adjusted. For the second time, my partner ordered curry and preferred it regular hotness. I can tell that my partner really enjoyed his Cream Dory Katsu Curry. He loves seafood and this one made his tummy happy. The cream dory per se is cooked perfectly and as always, the curry sauce is delicious. 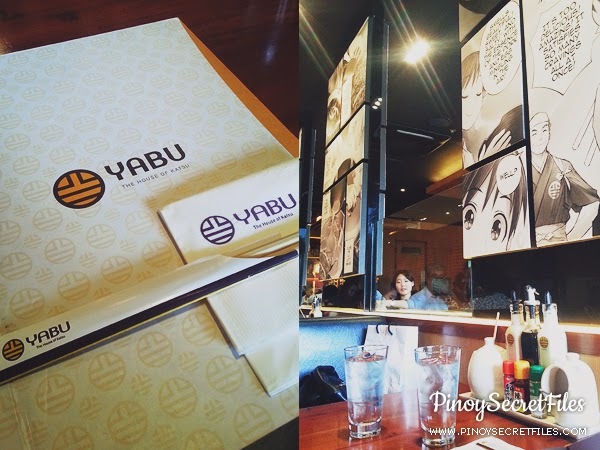 After one week, yes, just a week, we went to visit Yabu again. That was All saint's day but, I still have to do some business chore for Juyable. Anyway, my order was Tori Menchi Katsu and partner's was Hire Miso Katsu. 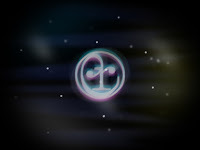 The picture below is Hire Miso Katsu. 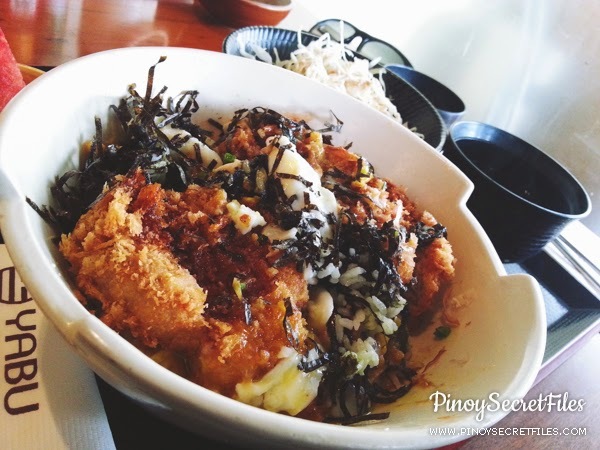 I believe my partner liked the Cream Dory Katsu Curry compared to this one. He wasn't able to finish his and we takw it home, maybe because he was tired of eating it and was "umay" already. The sauce was yummy though. Funny, this time we figured we should shoot the katsu not on top view, but instead focus on its inside/center since pretty much all katsu looks the same on the outside. Anyway, I don't know what's with that day, but me and my partner both was not able to finish our respective meals. I was a bit "umay" of eating my Tori Menchi Katsu. Honestly, I prefer my first katsu experience, which is plain Menchi Katsu. 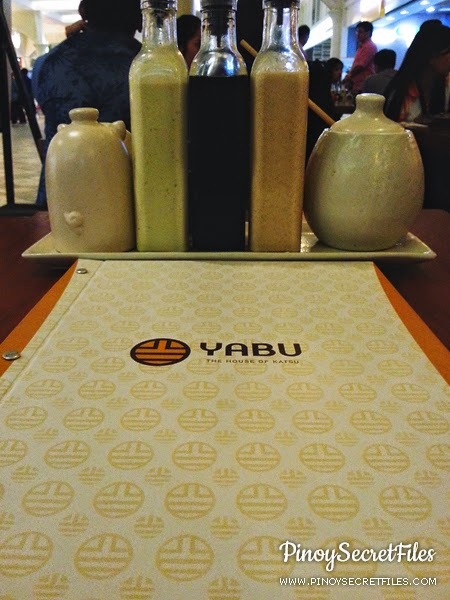 Meanwhile, during US thanksgiving, we opted to have our lunch at Yabu again. (Yes, since my partner and I are working for US based companies, we somehow celebrate thanksgiving). This time, we decided to try their Katsudon. Same as Katsu, all (except the main dish) are refillable. You get to enjoy unlimited organic brown or plain rice, miso soup, organic cabbage with with wasabi or goma dressing, Japanese pickles, and a bowl of fruit (pineapple and/or watermelon). I ordered Hire Special Katsudon while my partner's was Rosu Original Katsudon. Both Original and Special actually has the same price. The difference is just the ingredients I guess. 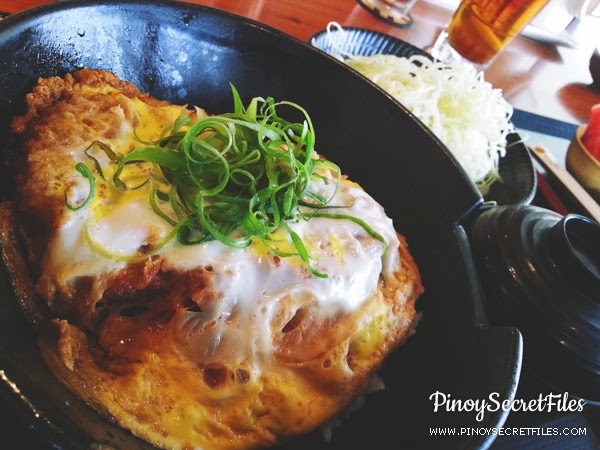 The original Katsudon is authentic katsudon, made the Yabu way: delicious cutlets dipped in egg and dredged in fresh panko, served over a bowl of steamed Japanese rice and covered with special Yabu sauce and beaten eggs. Again I get to taste it, hahaha :)) It's yummy but I think I prefer my Special Katsudon. The sauce is great too. 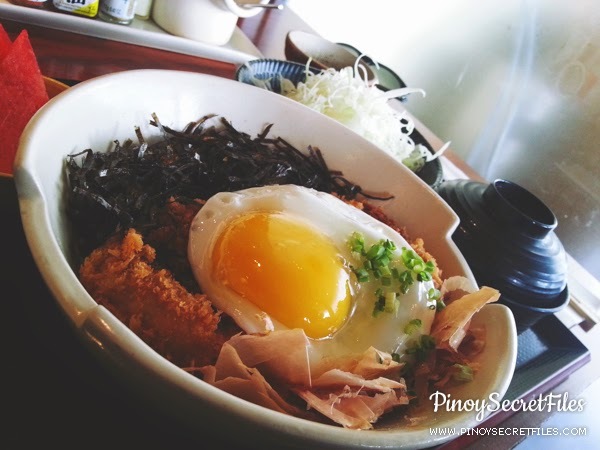 Hire Special Katsudon, drizzled with a light and sweet miso-based sauce, accompanied by nori, bonito flakes and a fried egg on top. A hint of shiso, or Japanese basil, is also found in the dish adding an unexpected freshness. Yes, it is so delicious, not only to the eyes, but it really made my tummy happy. I love the nori bits and the sauce. I will definitely order this again. I therefore give Yabu a 10 out of 10 rating. Why? Obviously, we love everything about them. 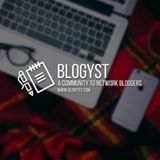 From the unlimited refillable items to the katsu and katsudons per se. The place is very cozy as well. 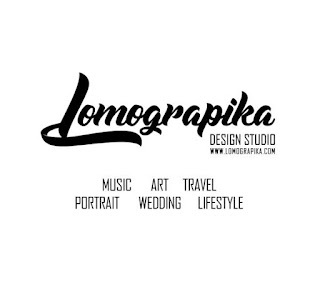 I really love their staff, very accommodating. Yabu is now one of my favorite restaurants. 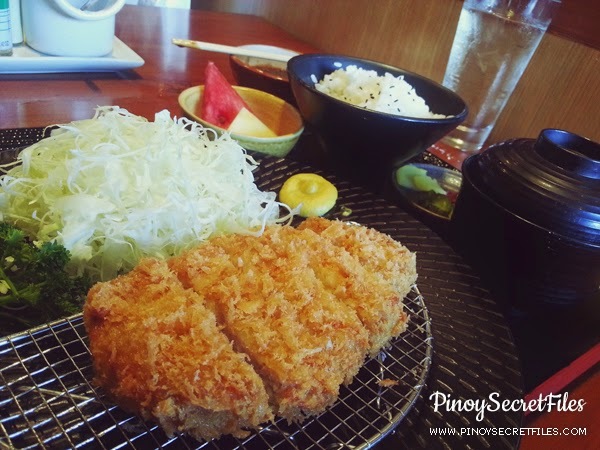 If ever you get a chance to drop by at Power Plant Mall in Rockwell, Yabu is located at its lower ground floor while in Glorietta 5, it is on the second floor. 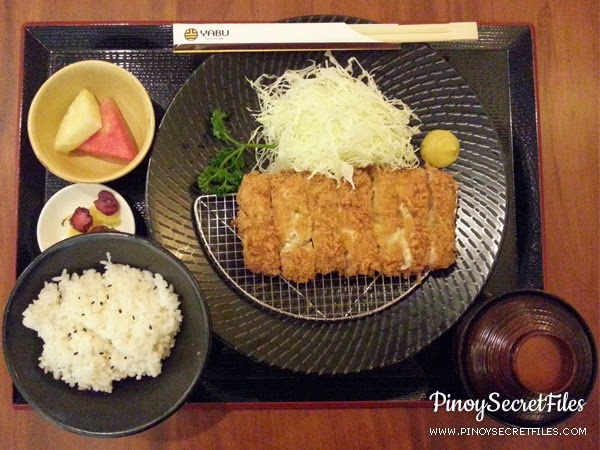 You may visit their website at www.yabu.ph for more information and queries about the products and locations.